Blame it on writer's block... here comes the long awaited trip report. Three full days of complete indulgence and relaxation is how I would summarize our trip last month to Tioman, an under-the-radar island off the Eastern Coast of Malaysia on the South China Sea. The trip came about because I had to think of something unique for T's 30th. As I couldn't quite yet grasp his design barometer, so a piece of design junk was definitely out of the question. I thought hard and long, and since he had never been to any interesting parts of Malaysia, a surprise island getaway would be a novelty, I had hoped. How should I describe this place that I finally nailed down? Japamala tries to be lavish yet laidback. With only 12 Thai-Balinese-styled chalets, the secluded resort made us feel like we were the only ones at the place. Service was impeccable with extremely well-trained and well-mannered Burmese attendants. After all, that's how you would coin a boutique hotel, wouldn't you. For me, it's that personal attention that matters. Here, you don't get noisy families and throngs of people everywhere at some of the mainstream hotels on the island. Along the sun-dappled beach on our side of island, we could kayak or swim out to see the colorful marine life underwater, or take a walk out to another stretch of sand for some solo sunning. Apart from having time to just chill by the beach with a book and a nice cool drink, the retreat is sprinkled with what I call instant gratifications. You can get a Thai massage by a skillful Thai therapist on an open-air deck, or you can have a nice picturesque lunch at the bar-restaurant, pearched up on stilts 100 metres away from the shore. Pictured above, the kitchen serves up a casual Italian fare with quite decent pizzas, pastas and grilled seafood. It boggles my mind as to why the management didn't choose to focus on local cuisine, since most of the guests hail from international places. I guess the forgiving bit was that the seafood served are fresh catch of the day by local fishermen around the island. 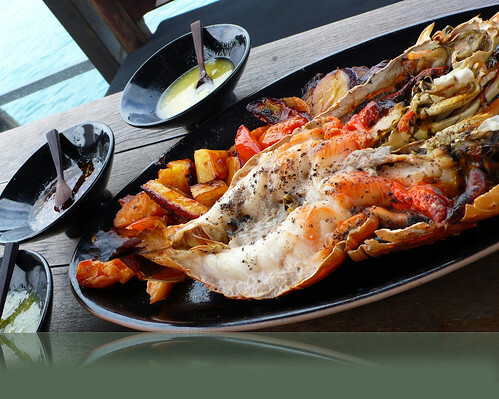 We had big tiger prawns, lobsters and fish such as sea-perch and grouper, locally known as Kerapu and Kerisi. And for the very least, the sauces accompanied are sprinkled with local flavors like tamarind, lemongrass and chillis. The other restaurant at Japamala serves up scrumptious breakfasts and dinners that we savored daily. Thai and Vietnamese influences are heavy on this one since the resort grew out of the success of the owners' first Indochinese restaurant venture in Kuala Lumpur. We had some really good squid stir-fried, curries, and salads made out of local ingredients like cilantro, peanuts, and green papaya. 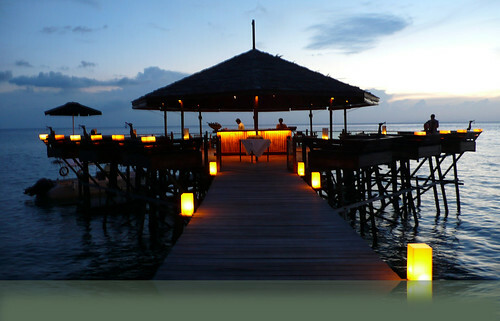 Dusk on the island -- the view of the restaurant on stilts -- is mersmerizing. Attendants start to light up candles everywhere on the wooden walkways leading to the chalets perched up on the hill. For the two of us, spending three days there was just about right given that all you do is to hone the skill of doing nothing. A time of rest, relax and reflection, can all be had at this tiny boutique resort if you're willing to forgo having to do different things on your vacation. posted by *kel at 12:15 p. m.
This looks like a little slice of heaven, but I was sold as soon as I laid eyes on the lobster. Yes, looks and sounds like a slice of heaven, indeed. you are many be 'green' with envy on your travels!! love yr blog...love the pic!....glad u have a nice time at Tioman, Tony likes it? I hope you remembers who I am... How hv u been in shanghai? Envy your being able to travel far and wide. You have a very nicely done up blog! Keep it going! Last but not least, keep in touch & take care! 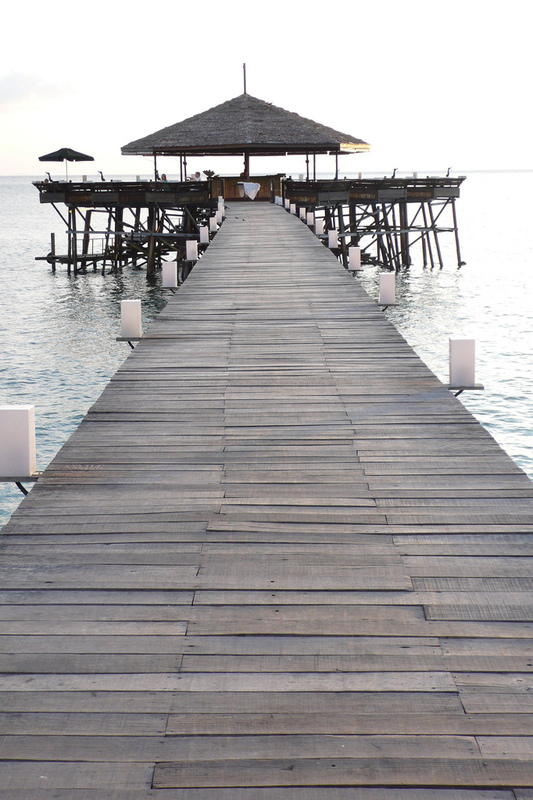 yes, if it's awesome beaches, deafening silence and exquisite lounging you're after, yes, Tioman will deliver. In spades. But if I may just add a quick note to repeat Tioman visitors, or those wishing to visit its shores in the future.